RANTS FROM MOMMYLAND: The Elf on the Shelf...Year-Round and with Teeth. Excellent. The Elf on the Shelf...Year-Round and with Teeth. Excellent. So, Kate is sort of slow to catch on to this. Last year, Lydia went on and on about some elf that sat in her house, and that she and the Cap;n would wig out every morning about the elf and who moved the elf and where is the elf and -- wow -- they really simultaneously hated and were really, really concerned about this elf. It turns out that people buy this small toy boy and move him around the house and you all already know this because you are good parents who use clever devices to keep your children well behaved in the weeks leading up to Christmas. Kate just leaves a Christmas tree with nothing underneath it and says, "well, maybe if you're good, the presents will show up. [looks at tree] Nope? Try harder." PS One more thing...if you're new to MommyLand, HELLO! first of all, and you might want to read about Randy and Dickie, because they are the fairies that rule our lives. Evil fairies. 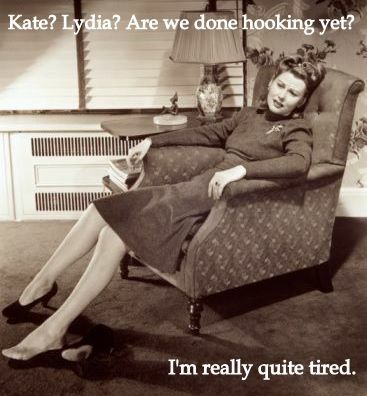 As you may have heard, Kate, Lydia, and I were a bit busy this month madly matching up hookers like it was our damn job. Problem is, I already have a job—as a stay-at-home mom to two very active children under the age of 4. So you may be wondering, who was doing my job this month while I was doing all the matchy-matchys? 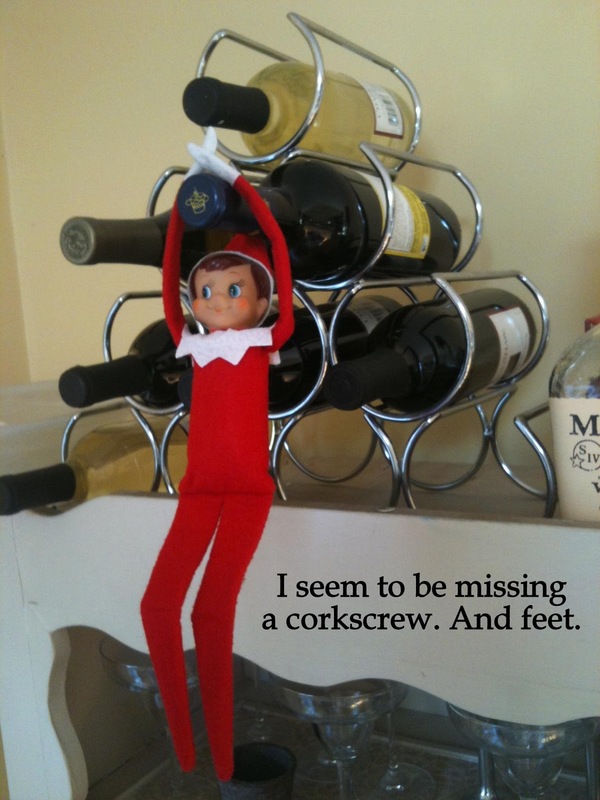 Meet Alfie, our Elf on the Shelf. You may have heard of this new tradition—this year every store seems to have a massive display of these little elves trapped in boxes just waiting to be adopted. I first heard about the Elf on the Shelf last year when he arrived at our home as a gift from Nana. But my kids were so young and I was so busy flapping around last December that I forgot to even take the little guy out of the box. This December my kids and I gingerly uncovered the neglected elf from the bottom of our Christmas box and I explained the new tradition to my kids: first we name the elf (Alfie was the 1 year-old’s choice) and then he is officially full of Santa’s magic. He watches the kids all day long and then at night flies back to Santa to report on whether the kids have been naughty or nice. He returns each morning and finds a new location in the house from which to observe, gather data, and create a formal report for presentation to Santa that night. After a continuous month-long analysis by Alfie and Santa, the cumulative daily reports either land your kids on the “Lotsa Presents” or the “No Gifts for You!” list. At first, I didn’t think much of Alfie’s effect on our family. I figured it would be a fun hunt each morning for the kids and I just moved him each night to the mantle, the bookshelf, the counter, wherever. But within a few days I started to notice there was WAY less fighting between the kids. The plates were being cleared after meals and the playroom was picked up. Kate called and my kids played quietly without bothering me once while I was on the phone with her. I only had to ask my daughter to use the potty once (instead of the usual 50 times). Holy crap, y’all. It was working! I had accidentally implemented a moralistic police state in my own home… but it. was. working! 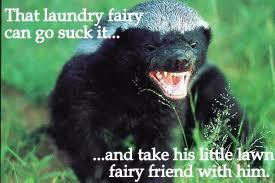 Barry is a distant cousin to the honey badger made famous by Randall’s amazing narration who has left Sub-Saharan Africa and come to live with you in your home! Unlike the seasonal Elf on the Shelf, Barry can be used year-round to terrify your young children into doing whatever you want. Need your kids to do some yard work this spring? If they don’t, Barry will eat all their Easter candy while they sleep. Want your kids to do their homework? If they give you flak, Barry will tell their principal to cancel summer vacation. He’ll do it, too. Barry don’t give a schmidt. Thank you, Elf on the Shelf, for teaching me that scaring the crap out of my children really is the most effective parenting strategy of all!